Liberal Democrat MP Layla Moran has admitted slapping her then-boyfriend at a party conference in 2013, leading to them both being arrested. 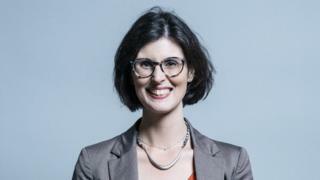 Ms Moran, the MP for Oxford West and Abingdon and tipped as a candidate for the Lib Dem leadership, posted a statement on Twitter saying she "wanted to respond to rumours". The row in Glasgow began over a lost computer cable, she said. She said she initially faced charges but they were subsequently dropped. In her statement, she said "in the heat of the moment, I slapped him because I felt threatened". Ms Moran and Richard Davis were arrested on 14 September at a hotel in Sauchiehall Street and detained in police custody in connection with assault and breach of the peace, Police Scotland said. The MP said the pair were detained by police, and she wrote: "I was initially charged in line with the zero-tolerance policy but then the charges were dropped and there was no case to answer." The Crown Office and Procurator Fiscal Service were contacted by the BBC but would not comment on closed or historic cases. A Lib Dem spokeswoman said: "We were aware of the personal nature of the statement issued by Layla, with Richard's support, and hope that their privacy is respected."